iHRIS and human resource for health information systems(HRIS) like it play a critical role in managing health workforce data. However, curating and maintaining data for the sake of it is not the goal. Using data to inform decisions is one of the primary objectives of the system. The USAID led CapacityPlus project led by IntraHealth recently published a technical brief on the subject and the iHRIS Community believes it is worth sharing. A strong and well-distributed health workforce is essential for achieving national and global health goals. Effective policies to address workforce challenges, such as retention, should be informed by relevant data; however, the availability of evidence does not guarantee that it will be used for decision-making. A new CapacityPlus technical brief shows national stakeholders how to transform evidence into policy decisions and subsequent action. Ensure that evidence generation informs and drives a country-owned mandate. Assess the costs of implementing the evidence-based policy intervention. Involve relevant stakeholders, including technical experts and those with decision-making authority, in evidence dissemination and review. Once agreement on the need for policy change has been reached, maximize momentum so that evidence is converted into action. Ensure that an accountable stakeholder leadership group oversees a defined process for bringing an evidence-based policy decision to action. Mitigate the effects of stakeholder turnover. 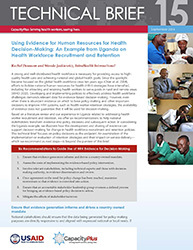 Using an example from Uganda, the authors illustrate how the development and sharing of evidence can support decision-making for change in health workforce recruitment and retention policies. To learn more, read the new publication, available as a PDF and an interactive online version. CapacityPlus would like to know what you think; send them your feedback. Thanks for this post Michael. I think we, in Namibia, can use this to help educate and encourage our current and future iHRIS users about the value of maintaining quality data and how to use this data to support decisions from facility to national level.